Summer 2017: PCOE 5900: Let them talk! Integrating culture, language and the three modes of communication. The three modes of communication inherently imply the implementation of an integral, meaningful and communicative approach to teaching and are equally important in the development of communicative competence. For this, the implementation of unrehearsed interactive communication tasks is very important. After an overview of concepts, this class will promote active participation by exploring a variety of issues including: how to move from oral practice to oral communication where the learner takes an active role that goes beyond responding to the teacher’s questions; how to provide opportunities for students to use the language in meaningful interaction and to negotiate meaning in real contexts; how to integrate multiple competencies and understand that the three modes of communication (interpersonal, interpretive and presentational) encompass all aspects of communicative competence, how to integrate language proficiency and cultural competence. In the second part of the class, the participants will collaborate to build on the approaches discussed to adapt, develop, and create learning opportunities for their students to increase target language use and develop integral lesson plans. These lessons will be shared and participants will leave with completely developed plans for use in their own classrooms. What are competencies? Developing Multiple Competencies. The Canale & Swain model. The 5K3M lesson plan: Five skills+three modes. Let’s Get to work: Develop your own 5K3M Lesson Plans. Barbara Reichenbach is a Senior Lecturer with 48 years of teaching experience on the K-12 and post-secondary levels. She has taught high school French and Spanish. At Ohio University, Barb serves as supervisor/advisor of our World Language Education teaching candidates. 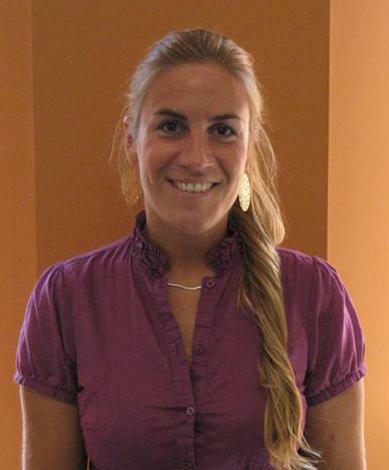 She teaches intermediate and advanced levels of Spanish and World Language Methodology. 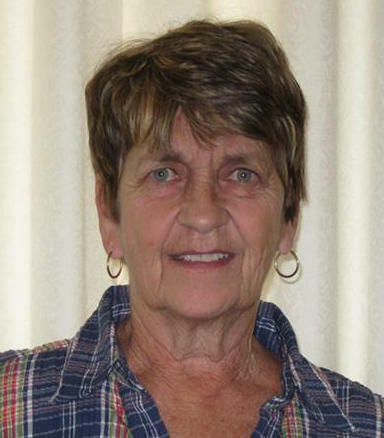 She has presented numerous workshops at OFLA, Central States and at Pennsylvania and New York State World Language Association Conferences. How long is this intensive class? This graduate-level class will be 4 days, from 9:00am to 5:00pm. Participants will register for 2 graduate credit hours. This class is intended for World Language teachers (7-12) in the state of Ohio. However, anybody who is interested in obtaining graduate credit and/or enhancing teaching skills is encouraged to apply. Is this class for teachers in any language? Yes, this is a class designed for World Language teachers. The concepts and approaches suggested can be implemented in any language. The facilitators have native or near native command of Spanish and French, and working knowledge of Italian and Portuguese. Teachers of other languages are welcome to attend (and are encouraged to contact us before registering). Is there a limited number of students per class? Yes. The maximum number of students allowed is 30. The class might be cancelled if fewer than 10 students sign up. There will be a wait list, if many participants are interested and we cannot accommodate them for the June session, a second session might be offered the first week of August. Yes. Registration will be completed in two steps: 1) Pre-registration. We recommend completing the pre-registration as soon as possible to guarantee a spot.This will allow us to plan ahead. 2) Participants have to register as non-degree seeking OU students to take this class. Application as non-degree seeking student deadline May 25th. Can I attend without applying as a non-degree seeking student? No. Participants must apply as an Ohio University student with a Post-Baccalaureate non-degree application. In the application form on the Program Selection page (page 2), enter ND9951 into the search box, the program will come up in the search result without having to scroll through all the program options. You still need to actually click on the program title to select it. Please complete fields as required on the application or processing will be delayed. On page 3, Application Information, students applying for workshops should select “workshop/post-baccalaureate” for the question “application type”. The application carries a place for you to choose a campus (Athens), even if the workshop is held somewhere else. Do I need to send/upload any documents to apply? Ohio University does NOT offer funding for teachers’ professional development. Teachers should contact their schools to learn about funding opportunities. 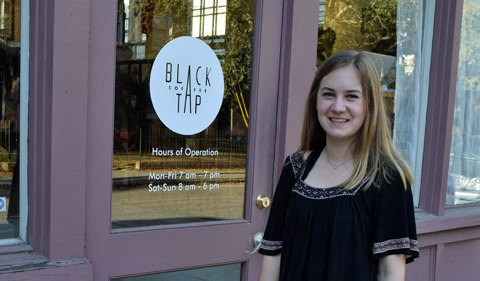 Most schools have tuition reimbursement programs. Check with your LPDC or administration for details. I registered but I can’t attend, is there a refund? If you drop the class before the first day, a 100% refund will be given. What is expected of me in/for class? Participants are expected to take an active role and commit to engage. Given the short duration of the class, a lot of information and hands-on activities will be included every day. Participants will not be required to complete extensive readings, but will be expected to complete some collaborative assignments. My question has not been answered. Whom do I contact? Congratulations Russian student Robert Angelo! The Russian Program is happy to share a wonderful news! 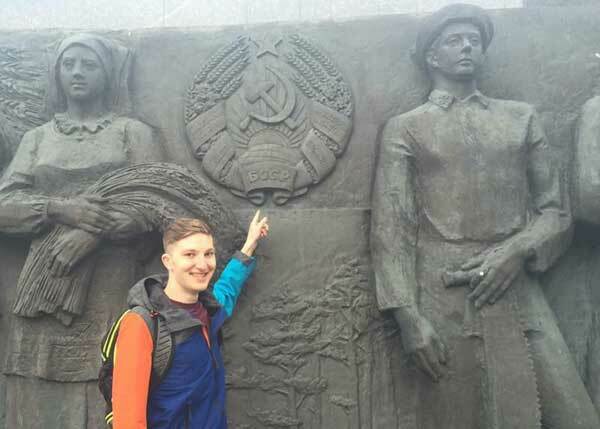 Our student, Robert Angelo (RUS 2120) received this year’s Critical Language Scholarship! The Critical Language Scholarship (CLS) Program is a fully funded summer overseas language and cultural immersion program for American undergraduate and graduate students studying one of the critical foreign languages. With the goal of broadening the base of Americans studying and mastering critical languages and building relationships between the people of the United States and other countries, CLS provides opportunities to a diverse range of students from across the United States at every level of language learning. The CLS Program is a program of the U.S. Department of State. Read more about the event in the Ohio University Compass. Congratulations on the successful event! Congratulations to Usman Suerkulov, who won an Honorable Mention in the Eighteenth Annual ACTR National Post-Secondary Russian Essay Contest! Congrats Usman and the Russian Department! Angela and Genoveva were the recipients of the TA Excellence in Teaching Award in recognition of their demonstrated teaching excellence after completing the College of Arts and Sciences Advanced Graduate Teaching Certificate program. HTC Spanish student Katherine Broughton presented her work on Paraguayan author Yula Riquelme de Molinas at the Cincinnati Conference in Romance Languages and Literatures on April 1, 2017. Dr. Daniel Torres gives an interview during the Feria Internacional de la lectura Yucatán in March 2017. He participated in the congreso de UC-Mexicanistas in Mérida, Yucatán. Congratulations to our magnificent Russian Students! Way back in February (Feb. 26), we received amazing news, once again, from the Russian Olympiad competition. 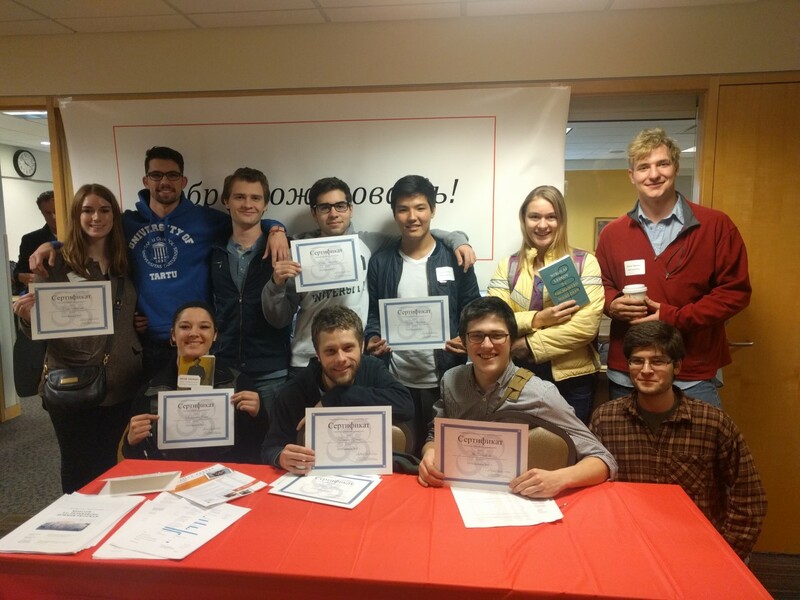 The OU Russian Program is proud to announce that eleven Russian students participated in the 2017 Undergraduate Competition (Olympiada) of Spoken Russian, which this year was hosted by Bowling Green State University. 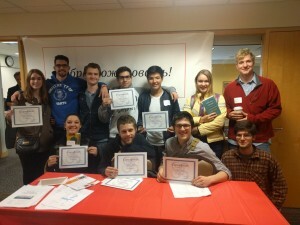 Tested on an oral interview, a poem recitation, and a presentation on a random topic, students competed within their respective levels in the all-day event dedicated to expanding and recognizing students’ achievements in Russian language. Our wonderful students delivered again! Kristina Denbow (RUS 1120) took 2d place in the Level 1 category. Samantha Jones (RUS 1120) took 3d place in the Level 1 category. Michael Abelev (RUS 4441) took 3d place in the Heritage Learner category, and Russel Gifford (RUS 3120) took 1st place in the Level 3 category. Our wonderful Russian students delivered again and again and again! 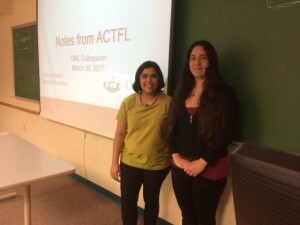 Junior Faculty Dr. Ashwini Ganeshan lead two graduate students, Carla Consolini (pictured here) and Hannah Morrison (currently in Spain), to the annual ACTFL conference in Boston. Dr. Ganeshan and Carla spoke at the annual DML Colloquium, organized by Dr. Molly Morrison, on March 30. They captured much of the information they learned at ACTFL that concerned new ways to test language in a more comprehensive and fruitful manner, and the latest suggestions on how to assess test results, classroom participation and much more. They gave stimulating presentations that generated a great Q&A session. Congratulations to German Student Elisa Bergmeier! 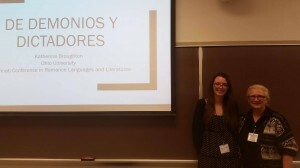 Sarah received the LAS Humanities Council Teaching Excellence Award at the University of Illinois.